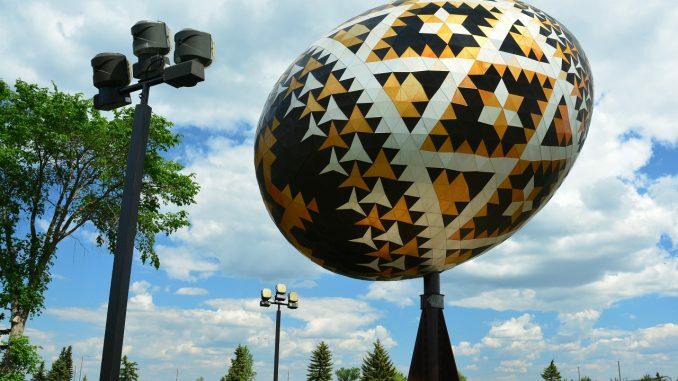 One of the main roadside attractions and tourist destinations along the Yellowhead Highway, The Vegreville Egg is a giant sculpture of a pysanka, a Ukrainian style Easter egg. The work by Paul Maxum Sembaliuk is built of anodized aluminum tiles fashioned over an aluminum framework and was commissioned by the people of Vergreville, Alberta to honor its high density of Ukrainian Canadians and the impact they have had on the city. In a strange twist of fate, the Vegreville Egg is dedicated to the 1975 centennial of the Royal Canadian Mounted Police. 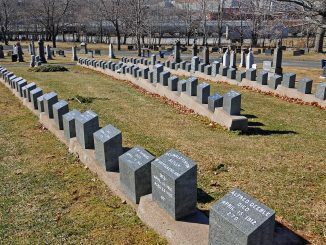 The story of this strange dedication is that a portion of the funding to build the egg came from the Alberta Century Celebrations Committee, and there was a stipulation with the grant that it was used for a monument to the R.C.M.P. 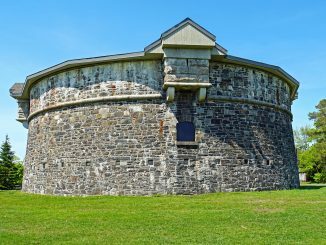 Therefore the giant egg was designed to symbolize the Royal Canadian Mounted Police who were responsible for peace and security brought to the largest multi-cultural region in the entirety of Canada. The construction of the egg really is a tribute to, as well as nod to the rich history of Ukrainian culture in Canada. And in this case, specifically the early Ukrainian settlements east of Edmonton, Alberta that make this little corner of the world so unique. 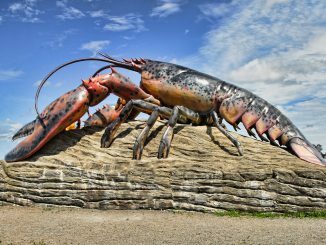 The egg is 31 ft (9 m) long and weighs 5,512 lbs (2,500 kg). The Vegreville Egg is the second largest pysanka in the world. The biggest pysanka in the world is in Kolomyia, Ukraine and was built in 2000. The Pysanka is really a complicated jigsaw puzzle with more than 12,000 pieces including; 3,512 visible facets, 6,978 nuts and bolts, and 177 internal struts. The sculpture features 524 star patterns and 2,208 equilateral triangles. The Vegreville Egg is located along the Yellowhead Highway (at the north side of Alberta Highway 16A in Elk’s Park). The Pysanka rests on a 27,000 pound (12,247 kg) base of concrete and steel and turns in the wind like a weather vane. The internal structure alone weighs 3,000 pounds and was fabricated by Cessco International Ltd. Edmonton.